“Starling” can handle thugs and palookas, but not daily life. 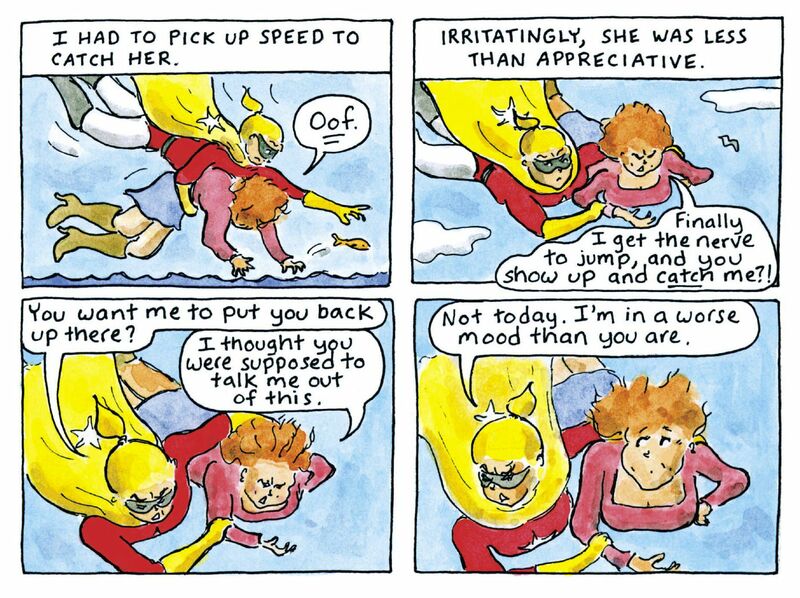 An episode from Starling in which the superheroine, having made a midair rescue of an aspiring suicide who’s leapt off a bridge, gets a not-especially-grateful reception. At home in Cambridge, Stossel works at her dining-room table. In their evil-fighting exploits, superheroes face some of the most daunting situations imaginable, but their private lives usually remain unproblematic. Apart from occasional girlfriend issues, Clark Kent simply goes about his business as, well, a mild-mannered reporter for a major metropolitan newspaper. Billionaire Bruce Wayne lounges around his mansion devoting himself to philanthropy when not suiting up as Batman. This is emphatically not the case with Amy Sturgess, the yuppie marketing executive who often transforms herself into the superheroine title character of a graphic novel, Starling, by Atlantic cartoonist Sage Stossel ’93. Amy gulps Xanax, laments her empty love life, gets outmaneuvered at the office by a conniving colleague, comes from a dysfunctional family with neglectful parents, and sees a shrink, whose diagnostic notes on her include “self-defeating negativity,” “self-sabotage,” and “procrastination.” Amy tends toward crankiness and often grumbles when summoned to fly from her window to stop a crime at some inconvenient hour. After busting the burglars or manhandling the malefactors, she may go all softhearted and not even turn them over to the police, sometimes sending the hoods on their way with a wad of cash to ease the trip. Not so easy when you are strong enough to pick up 300-pound bouncers or subdue muscular thugs, when your hands have built-in lightning bolts that can stun crooks with 750 volts of electricity, and you can fly like Superman, cape flapping in the wind. But Amy’s background doesn’t fit the superhero model. Maybe Superman was born on Krypton and rocketed to earth, but Amy was born to Earthling parents who owned 36 cats and was an outcast at school because her clothes reeked of cat urine. When her extraordinary powers start emerging at adolescence, the nonprofit Vigilante Justice Association, a loose federation of superheroes with a crime-fighting mission, soon signs her up and convinces her that yes, she can really jump out a window and fly. Stossel began publishing her cartoons in college, where her comic strip “Jody”—an alter ego whose stories derived from Stossel’s own collegiate misadventures—ran in The Harvard Crimson for four years. When trying to render characters’ emotions, “I would scour the funny pages, looking for examples of, say, resentment,” Stossel explains. “You look for things like which way the eyebrows are going.” She also practiced the expressions herself, with the result that her roommates sometimes asked her to work elsewhere. She joined The Atlantic in 1994, shortly after brother Scott Stossel ’91 was hired there as a fact checker. (He is now second-in-command among Atlantic editors; for more about him, see “Annals of Anxiety,” January-February, page 64.) 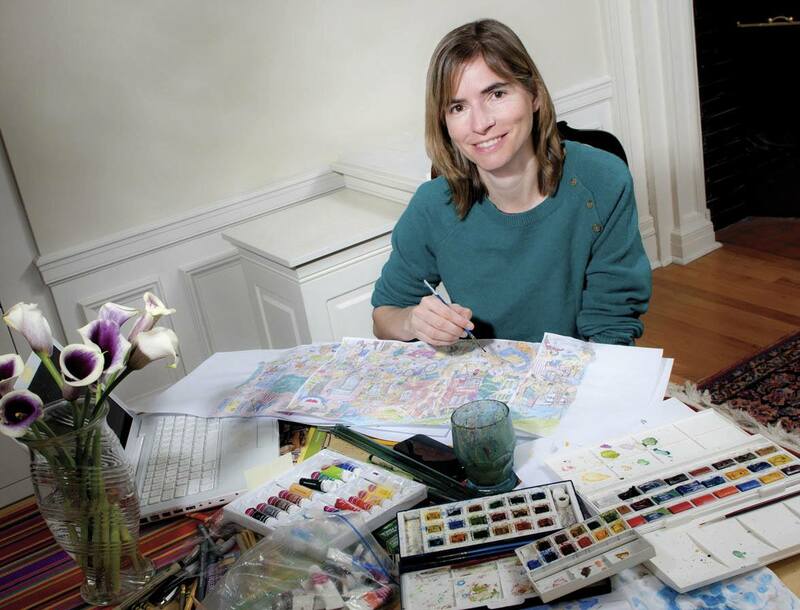 At first, she tracked down rights and permissions for the magazine, but soon began drawing editorial cartoons that evolved into her regular feature, “Sage, Ink.” She also wrote and illustrated the children’s books On the Loose in Boston (2009) and On the Loose in Washington (2013). Stossel, who works in ink with a watercolor gouache, solved some new problems with Starling, her first graphic novel. There were small things like figuring out how much action could be implied “between” the panels. Editors helped her with continuity issues, like making sure Amy’s shirt didn’t change color within a sequence.